Shhhh…. don’t tell my husband. I might have done a little stash enhancement this weekend. You see, I was surrounded by beautiful yarn at Yarnover. It practically sat up and begged me to take it all home. I found some beautiful skeins from Knitting My Way Home. 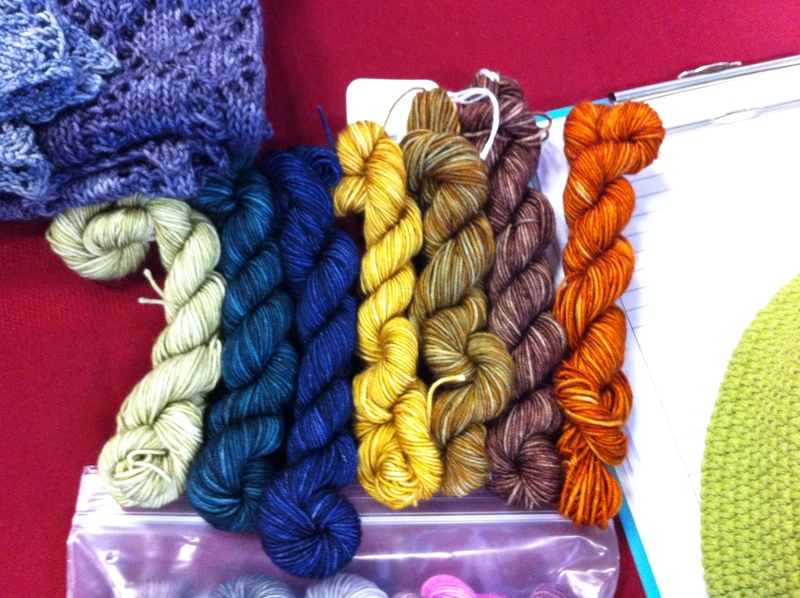 I also watched a gorgeous skein and some mini skeins go home with the woman who got there right before me. Ah well…. you snooze, you lose in the world of buying handspun yarn. I made up for it in other ways though. I also picked up two kits with mini skeins. One for a shawlette and one for a chevron cowl. What can I say? I’m a sucker for the mini skeins! I went to Yarnover to take a Franklin Habit class. The class was about learning to use the Schact Zoom Loom and sewing up the woven squares into a stole and knitting a lace edging. John Mullarkey taught the morning portion which was all about the loom. He was a very entertaining teacher and I would definitely take a class from him again. He was patient with us as we learned to warp our tiny little looms. Taking the itty bity little woven squares off the loom was very satisfying! 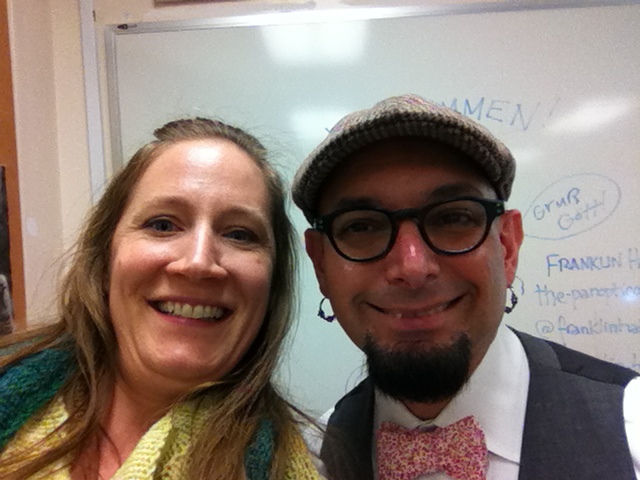 The afternoon was the class with Franklin Habit. Now this was the 2nd class I haven taken with Franklin, so I wasn’t surprised that he was much more quiet spoken than his blog might lead you to believe. Delores even left us a little note! Franklin’s teaching style is very structured – he leads you all the way through something before having you try it yourself. What I appreciated most was his willingness to give me the next steps to move forward as he helped those who maybe weren’t moving as quickly. I don’t think anyone felt rushed or held back by the group. And he was very gracious about posing for a picture with me. I promise I didn’t go all fan girly on him. The Knit Girllls released more information about Stash Dash here. It runs from May 22-Aug 14. You can choose from knitting a 3K, a 5K or a 10K’s worth of yarn from stash. UFO’s count, so go ahead and use this as a reason to finish a lot of those half done projects you’ve got hanging around. (please don’t tell me I’m the only one) I’ve also heard that as long as it’s in your stash, the yarn counts. It doesn’t matter how long it’s been marinating in there. I have enough started projects that I could almost do a 10K (10,936 yds of yarn). However, I’m not really sure that’s realistic for me. At least not without telling The Boss I am going on a 3 month vacation and hiring Merry Maids to vacuum under my feet as I knit and eat bon bons on the couch. So I’m going to shoot for a 5K. I’ll share my plan for how I’m going to cross the finish line next week. Our training starts today! Leave me a comment if you’re joining me on this trip to Crazy Town.